My daughter asks me am I beautiful? I am stunned by this question. Because I have been asking myself this question “Am I beautiful?” for as long as I remember. As a child, as a young lady and now as a mother who is about to finish four decades on this planet. I first wondered about this question when I read the Brothers Grimm fairy tales as a small child. Then came the Fair and Lovely commercial which taught me that brown skin wasn’t lovely, while fair skin was. And only applying fair and lovely made you fairer and thus prettier. I circled back to the mirror on the wall and wondered – did fairest mean most beautiful or most white? After all Snow White was white and hence beautiful. Looking at my dirty brown skin, I knew I was neither fair nor beautiful. As I grew up, I had numerous occasions to ponder about the question and ask myself am I beautiful. When it was time to get married, a concerned family member exclaimed – how will you get married in this fairness crazy country of ours? You are neither “very very” fair nor milky white. Another suggested – drink turmeric milk and apply saffron on your skin to be fairer and more beautiful. My husband told me after we got married – I fell for you not for your skin colour but for the beautiful person you are. My daughter tells me I am the most beautiful person in the world. And I light up. Motherhood makes you beautiful. It was time I had that talk with her. It was time I gave her the wisdom I had collected over the years. You are like dark chocolate (she loves it), isn’t that something to cherish about? Also, beauty is not defined by your skin colour because it’s not for you to choose, but by the soul you have. You are kind. You think about, worry about and care for others. You are a loyal friend. Loyalty is a scarce commodity and loyal friends are found one in a thousand. Everyone craves for a loyal friend but not many get one. You respect yourself and others for the way they are and the way they act or react. You go the extra mile to help people. You smile even when there is nothing to smile about and make the best out of every situation. You are beautiful now, but you will be more beautiful if you have all these qualities. I don’t know if she understood me, she gave me a gap-toothed grin. I know I will have to repeat this at every stage till she is able fully understand, till she never has to ask – Am I beautiful? Akshata, it breaks my heart to hear the same question that I had asked as a small child coming out of my daughter’s mouth. It shows nothing has changed in the 30+ years. We are still the same society – the same thinking. Fair complexion is of utmost importance and body shaming is still rampant. I have taken it upon myself to not let my daughter suffer from this. She is already growing into a confident young lady and I want it to be like that. I have realised I cannot change the mindset of the society but I can teach my daughter to not let it bother her. Thanks so much Akshata, it feels so nice to have a kindred soul. This is so beautiful, Anshu. I totally agree that motherhood makes us the most beautiful. And I have seen that for our kids we are the most beautiful person in the world. Because they don’t measure through skin color but the love and care that connects us. Thanks you for participating in the contest. Beautiful thoughts by a beautiful mom of a beautiful daughter. Dark chocolate skin of a milky white soul. Respect, help, kindness are the true colours. Colors are just a name game. Love duskyness of we Indian woman always. How true Pragun! Indian skin is beautiful as it is. My husband tells me that the skin colour suits only a specific type of person. 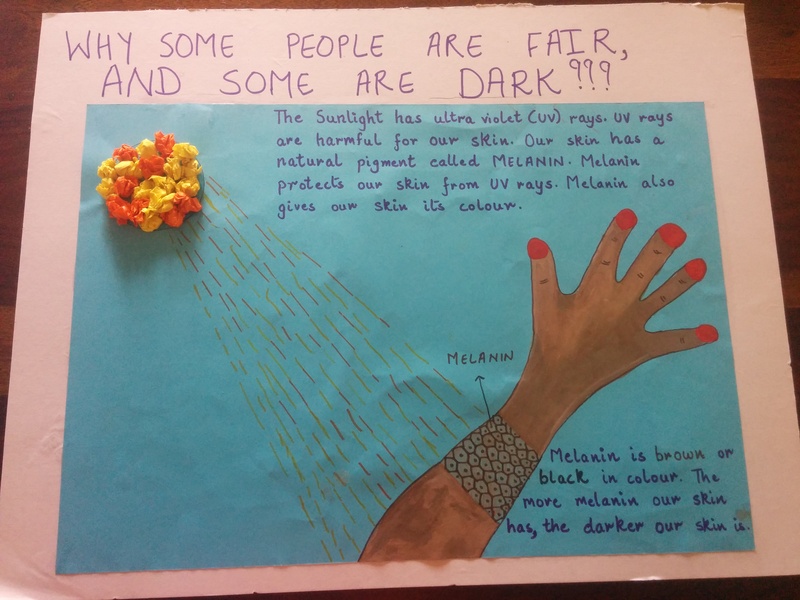 A dark skinned person may not look better in fair skin while a fair skinned person might not find his or her looks improved if he is given brown skin. Been there…thought that di and still do…Rhea is fairer than me like her dad and everytime I get to hear “Oh your daughter is like her father! !” I just smile and let go…even if we change our perception, the world will keep reminding you, so now I have the I don’t care attitude..yeah she’s fair but she’s cute like Mumma…is my response? Anshu, thank you for posting this honest, thoughtful reflection. I was deeply touched by your story of self-doubt and discovery. Even through this post, I can tell that you are a beautiful person. Being raised by you, I imagine your daughter will be a beautiful person, too. Well written. Thank you Ron for appreciating the post and the sentiment behind. I hope to raise a confident daughter who is comfortable in her own skin. Thank you once again!